Do face-to-face meeting quotas work? https://align.me/wp-content/uploads/align-me-logo.png 0 0 Hugh Macfarlane https://align.me/wp-content/uploads/align-me-logo.png Hugh Macfarlane2013-01-31 04:21:322018-03-22 16:39:41Do face-to-face meeting quotas work? 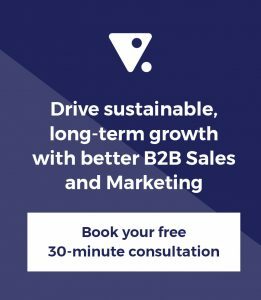 B2B Sales: Is your funnel fighting fit or fundamentally flabby? https://align.me/wp-content/uploads/theflabbyfunnel.jpg 147 602 Bob Apollo https://align.me/wp-content/uploads/align-me-logo.png Bob Apollo2013-01-29 02:41:242018-03-23 15:09:23B2B Sales: Is your funnel fighting fit or fundamentally flabby? If Alignment is such a good thing, why is it so hard to achieve? https://align.me/wp-content/uploads/align-me-logo.png 0 0 Bob Apollo https://align.me/wp-content/uploads/align-me-logo.png Bob Apollo2013-01-13 22:41:382017-08-15 10:05:24If Alignment is such a good thing, why is it so hard to achieve?